Graphic – unknown creator. Quote by Carrie Fisher. This is something I’ve only learned in the past few months, maybe a year. 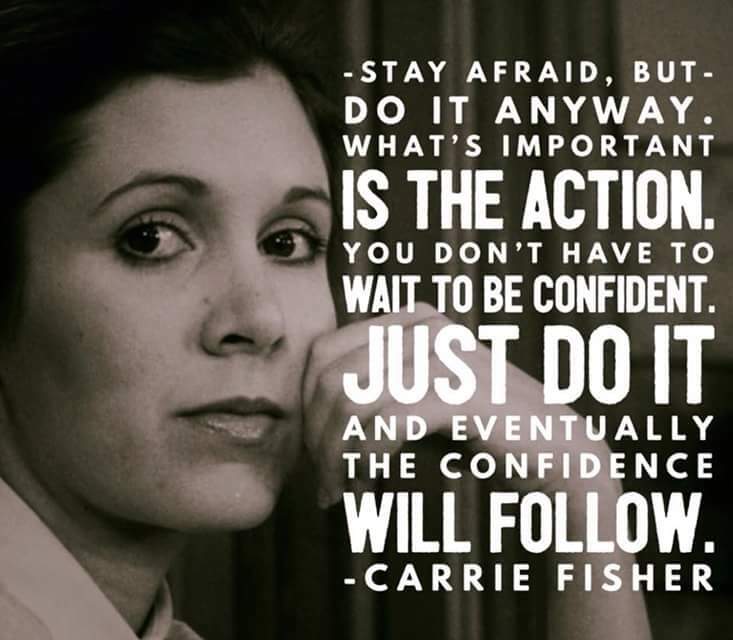 I continue to carry this sentiment and Carrie in my heart. I can do it. I can. 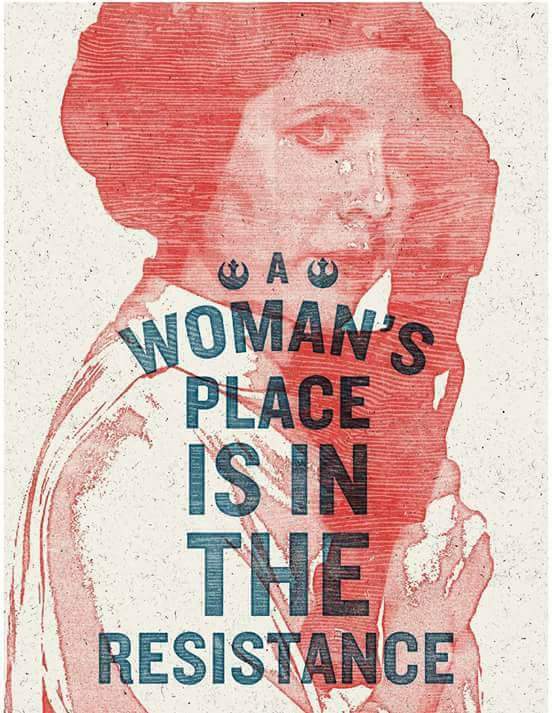 Protest poster from the Women’s March on Washington. 1/21/17. Unknown to credit at this time. I have long admired Carrie Fisher from the moment she appeared as a repeated hologram with Luke’s connection to her becoming mine. The long white robe, the cinnamon bun hair, the lower register of her voice and the slight rasp. She was a Princess but she wasn’t like any of the princesses we’d encountered before. She was the daughter of a Senator; her identity seemingly connected and overshadowed by her father and the other men in her life until we really met her. She was the leader of the Resistance. She didn’t let her hair get in her way, and she wore it how she liked it. Her clothes and style never defined her. And neither could we. That was true for her real life counterpart. For me, Carrie Fisher, like Jamie Lee Curtis, Melanie Griffith, and later on Rashida Jones, was a bridge from oldtime Hollywood to a new generation of strong women from strong women. My mother watched Debbie Reynolds and Vivian Leigh; We both watched Tippi Hedron, and I watched Peggy Lipton and then their daughters. Just when you thought Carrie was a one hit wonder, diving head first into drugs and promiscuity, she would come out with something else; something funny, something remarkable, something for all of us. When I discovered that she was a writer, I jumped for joy inside my head. As a wannabe writer, I loved finding other writers, especially those that had done something else before. It can be done at any age, and Carrie was the epitome of doing it at any age. It also showed me that it was attainable. Yes, she had some connections and people wanted to hear her stories that were somewhat autobiographical, watching her do it made it attainable for me too. That is so important to a budding anything; to have that one person who you can look to and say, hey, that’s kind of me, I can do this. I got this. I needed those statements in a point in my life that they came and I was reminded of how much I loved and admired Carrie. I really love the Internet. They say chat-rooms are the trailer park of the internet. but I find it amazing.